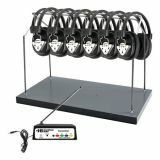 A stereo jackbox can be connected to the 3.5mm headphone plug to use the Spirit SD as a learning center for a small group of differentiated learners to listen through connected headphones without disrupting the rest of the class. The Spirit SD is also available as 4 and 6-person Learning Centers with an included 10-person jackbox and Switchable Stereo/Mono headphones. 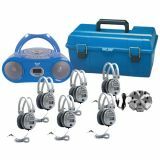 Everything you need for classroom audio for up to 6 students at a time - just add an audio source! Constructed of heavy gauge plastic, this jackbox features a 4 foot long connection cable with dual source plug for a 1/4 inch or 1/8 inch jack, making it compatible with a wide range of media players! Paired with our robust SC-7V stereo headphones,your students will get the most out of their high tech lessons. The noise-isolating, closed-back design of this unit provides a superior learning environment. And now the SC-7V features our unique Dura-Cord™ – the chew, kink and knot-resistant, PVC-jacketed, braided cord – specially-designed to be more durable and reliable than ever! 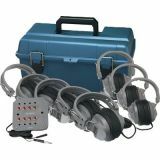 Everything you need for classroom audio for up to 8 students at a time - just add an audio source! Constructed of heavy gauge plastic, this jackbox features a 4 foot long connection cable with dual source plug for a 1/4 inch or 1/8 inch jack, making it compatible with a wide range of media players! Paired with our robust SC-7V stereo headphones,your students will get the most out of their high tech lessons. The noise-isolating, closed-back design of this unit provides a superior learning environment. And now the SC-7V features our unique Dura-Cord™ – the chew, kink and knot-resistant, PVC-jacketed, braided cord – specially-designed to be more durable and reliable than ever! This portable media player allows you to stream music from your Bluetooth enabled device for unrivaled control of your listening experience! Supports Bluetooth v2.0 and features a top-load CD player (CD, CD-R/RW), digital FM radio with built-in antenna, LCD display with white backlight, programmable tracks, digital volume control, built-in stereo speakers, 3.5mm headphone jack, and a wireless range of 33 feet with Deluxe Noise-Reducing Headphones. Built-in AC power cable or use 6 “C” batteries, not included. One-year warranty. 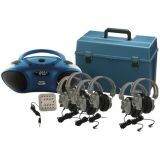 Built to deliver the latest audio technology to the classroom in an easy-to-use package! Plays audio CD, CD-R, CD-RW via top-loading CD player, as well as MP3 files from a USB flash drive through the built-in USB port. The 3W amplifier and built-in speaker deliver clear sound to small groups. Features backlit LCD track display, CD anti-skip technology, 1⁄8" and 1⁄4" stereo outputs for connecting headphones and jackboxes, and digital pushbutton volume control. AC power or use 4 “C” batteries, not included. One-year warranty. 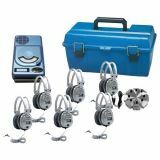 Includes HECHACX205 Portable Classroom CD/USB Player, 6 Deluxe Headphones, jackbox with individual volume controls, and a lockable carry case. One-year warranty. 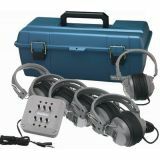 Designed and built to withstand the rigors of classroom use while providing high quality sound. Wirelessly stream music from your Bluetooth ready tablet, smart phone, computer or other Bluetooth enabled device! Also features a fully programmable CD player, cassette recorder, microphone input, FM radio, digital LCD display, and 2 full-range 3" speakers with 4W audio output. 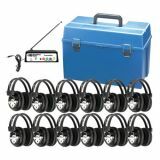 An exclusive set of six 1⁄8" headphone jacks located on the back make this unit the best choice for classroom listening center use. AC power or use 8 “C” batteries, not included. One-year warranty. 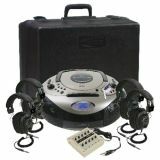 Includes HECMPC5050 Boom Box, 6 Deluxe Headphones, jackbox with individual volume controls, and a lockable carry case.